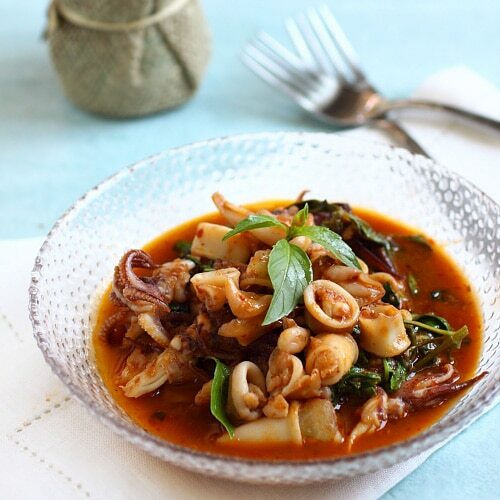 Thai basil squid is a popular Thai recipe using squid, basil leaves, and roasted chili paste. Easy recipe that takes only 30 minutes and tastes delicious. Thai roasted chilli paste or nam prik phao is the secret to many dishes in Thai cuisine; it’s what gives Tom Yum and many Thai dishes their oomph. Recently, the chili paste has become a staple in my pantry. I use it to make various dishes, for example: fried rice and clams. This Thai basil squid is flavored with dollops of Thai roasted chilli paste and heaps of fresh Thai basil leaves, a few bird-eye’s chilies, with a hint of lime juice and fish sauce completing this delicious dish. If you are in the United States, you can get nam prik phao at many Asian stores, the brand is “Pantai” brand. If you like, you can also make the chili paste from scratch, following recipes from my two trusted sources: Chez Pim and She Simmers. You can also try out my other favorite squid recipe: Taiwanese 3-cup squid, which is equally delectable. Heat up a wok with the oil. Add the roasted chili paste and bird's eye chilies and stir fry until you smell the spicy aroma. Add the squid into the wok and stir to combine well. Add the fish sauce and lime juice. Stir a few times before adding the basil leaves. As soon as the leaves are wilted and the squid completely cooked, dish out and serve immediately with rice. All photos and recipes on Rasa Malaysia are copyright protected. Please do not use the photos and recipes without prior written permission. If you wish to republish this recipe, please rewrite the recipe in your own words instead of copy and paste and link back to http://rasamalaysia.com/thai-basil-squid/. Thank you very much! Oh yes – my secret weapon to give amazing flavor. I keep two different kinds, chile garlic paste and chile garlic paste in sesame oil. I made this last night. Another great recipe. It was so yummy. hi.. i made the squid basil and for some reason it was not saucy at all..just dry..it still tasted good but i love eating the sauce with rice..what did i do wrong? Made this with fresh tuna and fresh salmon and was delicious! OMG! So good! I LOVE squid. Squid, scallops, mussels, and clams are my FAVORITE foods ever. My nephew loves them all too. Great recipes! Great you love this recipe. Nice Post. Thanks for shared. A menu of dishes that inspires our appetite to eat.